Contracts | MAKE YOUR OWN BREAK! 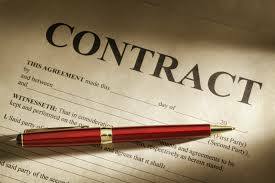 When working on low budget or independent productions sometimes the need for contractual agreements is over looked. Any time you hire someone to be part of you team for a production, it is a good idea to have both parties sign a written agreement outlining the job responsibilities, expectations of the employer, hours/days the service is required, turn around time (deadline for work completed) and compensation. You can put as many or as little details in the agreement as you deem necessary. The more specific you are the more clear your expectations are of your cast and crew. It is standard for actors and anyone appearing on camera to sign release forms and for crew members to sign deal memos. When writers and performers come together to produce the division of responsibility and ownership of the project is not clear. It is a good idea to have a long talk before you decide to partner with a friend or colleague on a production. Make sure it is clear what each person’s strengths and weaknesses are…that is usually a good way to figure out who should take on what. There are many responsibilities that are less “fun” than others but need attention, patience and commitment. Make sure you divide responsibilities equally and meet regularly to check in with each other. Talking to a lawyer is always a good idea when embarking on any production, especially if intellectual property is concerned. The laws vary from state to state and it is important to have the correct documentation to protect yourself and your work. This entry was posted in Acting, Film Production, Low Budget Production, Performance Art, Performing, Producing 101, Producing Advice, Theatre Production, Uncategorized, Writing and tagged Acting, Art, Casting, character breakdown, Creative Process, Director, Entertainment, Film, Film Festivals, Film Production, Film Shoot, Fringe Festivals, Hollywood, Hollywood Fringe Festival, Independent Films, Los Angeles, Low Budget Production, New York City, Producing, Solo Shows, stage manager, Theatre, Theatre Production, Web Series, Writing. Bookmark the permalink.